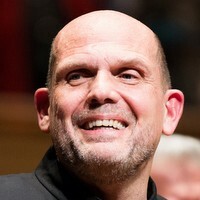 Jaap van Zweden has risen rapidly in little more than a decade to become one of today’s most sought-after conductors. He has been music director of the Dallas Symphony Orchestra since 2008, holding the Louise W. & Edmund J. Kahn Music Directorship, and music director of the Hong Kong Philharmonic Orchestra since 2012. He was named music director of the New York Philharmonic in January 2016. Mr. van Zweden remains honorary chief conductor of the Netherlands Radio Philharmonic Orchestra and conductor emeritus of the Netherlands Radio Chamber Orchestra. In November 2011, Mr. van Zweden was named Musical America’s 2012 Conductor of the Year in recognition of his critically acclaimed work as music director of the Dallas Symphony Orchestra and as a guest conductor with the most prestigious US orchestras. Mr. van Zweden last appeared with the New York Philharmonic in October 2015 in concerts of Beethoven’s Fifth Symphony, Britten’s Sinfonia da Requiem, Op. 20, and Mozart’s Piano Concerto in A major, K.488, with the Philharmonic’s Artist-in-Association Inon Barnatan. Additional highlights of the 2015–16 season include return visits to the Orchestre de Paris and the Rotterdam and London Philharmonic Orchestras, as well as debut performances with the Accademia Nazionale di Santa Cecilia and the Czech Philharmonic. Mr. van Zweden returned to the Netherlands Radio Philharmonic in the fall of 2015 to lead a concert performance of Wagner’s Tristan und Isolde, and makes his debut at the Vienna Staatsoper in performances of Wagner’s Lohengrin in May. In 1997, Jaap van Zweden and his wife, Aaltje, established the Papageno Foundation, the objective being to support families of children with autism. Over the years, that support has taken shape through a number of programs in which professional music therapists and musicians, receiving additional training from Papageno, use music as a major tool in their work with autistic children. Papageno House, a new home for autistic young adults and children, was opened in Laren, the Netherlands, in August 2015, with Queen Máxima in attendance.